Charlotte Canelli is the library director of the Morrill Memorial Library in Norwood, Massachusetts. Read Charlotte's column in the December 14, 2017 edition of the Norwood Transcript and Bulletin. Life changed quickly at the end of the 20th century and it seems to continuing that rapid change in the 21st. Personal computers, cell phones, email, and the Internet were the first to crash onto the scene at public libraries before the Y2K scare. Since then, streaming video, digital books and magazines, gadgets, and much more have found their way into the library and onto the Cloud. Many of the library’s staff who served Norwood from its desks and telephones in the 20th century have retired in the past 17 years. One of those librarians, Margot Sullivan, came to Norwood from the Boston Public Library in the 1980’s. Although she officially retired her position as Adult Services Librarian in 2008, she continued her very popular First Thursday book discussion group for nearly another decade. After 33 years leading the group, she recently decided to move closer to her son and his family in New Jersey. Of course no one could replace Margot or her leadership of the First Thursday book group. Margot’s fans had read well over 250 books in the thirty-plus years that they met within the library’s rooms. For the first discussion of the Turn the Page book discussion group in November, librarians Alli Palmgren and Nancy Ling chose David McCullough’s 2015 biography of the Wright Brothers. Over forty-five enthusiastic readers took the challenge, checked out the book in advance, and attended the Turn the Page discussions on Wednesday, November 15. 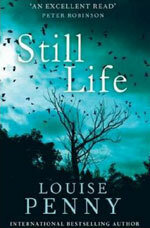 December’s discussion will continue this new format with Louise Penny’s first book, Still Life. Technical Services Assistant Patty Bailey and I are reading the book for what we hope will be a lively talk. Penny’s mystery Still Life, published in 2005, is the beginning book in the Three Pines Mystery series. Her latest and thirteenth book, Glass Houses, was published just this past summer. Although I’d never read Louise Penny before now, I had heard people rave about her stories for years. Her Three Pines mystery series (and one novella for teens) feature Armand Gamache, Chief Inspector for Homicide (and eventually superintendent) of the Sûreté du Québec, the provincial police force for the Canadian province of Quebec. The setting is the fictional village of Three Pines, not far from Montreal. (Author Penny claims that Three Pines is somewhat of a compilation of a few villages she has known and loved.) The mystery is the death of retired teacher Jane Neal, killed while walking in the woods near her home. Louise Penny’s career did not begin with writing. Penny became a radio broadcaster for the Canadian Broadcasting Corporation after graduating from college at 21. She remained in that professions for 18 years. As a professional radio host in various locations across Canada, Penny suffered from a deep loneliness, and at the age of 35 realized that she had become an alcoholic. She did not like herself and admits that continuing her drinking would have cost her everything – her friends, family and career – had she not broken the downward spiral. After giving up alcohol and marrying a well-known Montreal hematologist, she left radio and was able to focus on her writing. Dr. Michael Whitehead convinced Penny to give up her broadcasting career to write. A historical novel did not materialize, however, and she suddenly, and fortuitously, decided to write mystery novels, one of her own favorite genres. She claims her leading man, Inspector Gamache, is modeled on her husband and she credits Whitehead’s love and support for much of her success. Sadly, Whitehead succumbed to dementia at the age of 82. Penny, twenty-years his junior, cared for him until his death in 2016 in gratitude for giving her the freedom to write. The name of the village of Three Pines itself has a mystique of its own. (Besides, of course, having an abnormally high murder rate. For a small village, you certainly wouldn’t expect so many mysterious deaths.) The lore behind three pine trees planted together in Canadian towns and villages, just over the border of New England states, is interesting. The three pines were supposedly code for the Loyalists to the British crown, those who fled America during the Revolutionary War. A house with three white pines in the front was a signal that Loyalists could seek refuge there. While there does not seem to be much historical reference to what might just be a legend, it adds intrigue to Penny’s tales. Still Life was filmed as a made-for-television movie in 2013. While it was an adaptation, Penny co-wrote the screenplay and was pleased with it. (It’s available in the Minuteman Library catalog and should not be mistaken with either the Italian movie starring Eddie Marsden or the Chinese film directed by Jia Zhang-Ke. All three are titled Still Life.) Still Life: The Three Pines Mystery is fun with great characterization and scenery. One of the complaints is the decidedly British accent of Inspector Gamache who most assuredly spoke both Canadian English and French. Many versions of Still Life can be found in the Minuteman Library catalog, including the audiobook, e-book, and large print. A version of the audiobook narrated by Ralph Cosham is currently available free on Hoopla, one of our library’s streaming services. The Turn the Page Book Discussion group will meet on Wednesday, December 20th at both 10 am and 7 pm. We ask that you register as free refreshments are offered to all participants. Patty Bailey and I will be sharing a publisher’s map of Three Pines and other interesting trivia about Louise Penny and Still Life. Call the library for more information.